Guest post by two-time Paralympic archer and Mobilegs user, Lindsey Carmichael. I suppose I could be predictable and say that the most exciting thing about the Paralympic Games was standing on the podium to receive my Bronze Medal. It was certainly one of the best moments of my life. 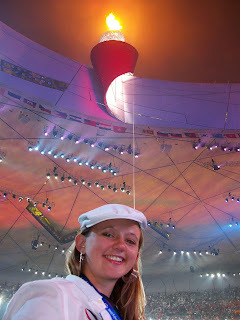 But instead, I have to admit that the most exciting moment was the Opening Ceremonies—both for Athens and Beijing. Lindsey at Opening Ceremonies of the Beijing Paralympics. To this day, if I tell the full story of what it was like to be a part of the Opening Ceremonies, I will begin to get choked up and my eyes will become teary. I have seen this happen for other people, too, even the coaches and team staff members who were present. You see, athletes aren’t spectators like everyone else. We are part of the show. So, on the day of the Ceremonies, the officials keep the athletes in the tunnel system of the stadium for hours until just the right moment for the Parade of Nations to begin. Everyone is in full uniform and grouped together by country. The waiting is almost painful, because everyone is so tense and excited. Finally, you can hear the Ceremonies begin with distant rumbles and music. They begin calling the countries out in order, one by one, and the line moves slowly. I will never forget the moment when Team USA was poised at the entrance to Oaka Stadium in Athens. Picture hundreds of athletes in red, white, and blue, holding our breaths in the dim light of the tunnel. Just beyond the opening, there is a swirl of brilliant light and color. Then imagine hearing the booming words of the stadium announcer in English, French, and Greek: “Ladies and gentlemen! The United States of America!” We surged out onto the track and into the bright light. The roar of the crowd was stupefyingly loud. I have never felt anything like it—it wasn’t just deafening, it was an avalanche of cheers. Around the bowl of the stadium, tens of thousands of people rose to their feet and snapped photographs, which produced a wave of glittering flashes. I have seldom felt so proud to be an athlete and an American as I did at that moment. The same exact thing happened in China, in the Bird’s Nest Stadium with an even larger crowd. I am not exaggerating when I say that both times, the Opening Ceremonies changed my life. Adding to the experience, I was struck by a true sense of community among all of the athletes. I had never seen so many wheelchairs, crutches, and canes all in one place, and all in different styles and sizes—some of them pretty tricked out with fancy paint jobs, too. Wherever you went, all over the Athlete Village and competition venues, there were people from all countries of the world who might have otherwise felt out of place in “normal” society. And yet, there were so many of us that the usual barriers began toppling almost immediately. Even the most introverted people became comfortable speaking about their disability, their struggles to adapt, and the hundred little ways they had overcome their obstacles each and every day. We even had a professional comedian, one of our Team USA soccer players, give a stand-up routine to a crowd full of athletes—the kinds of jokes that perhaps only a disabled person might be able to laugh at, but good clean fun for us, anyway. It was surprising to discover that a community like that exists at all. Throughout my Olympic experiences, I felt tremendous freedom to be exactly who I am, regardless of appearance or ability.